A non-profit, all volunteer organization dedicated to the rescue and adoption of homeless Shih Tzu and Lhasa Apsos. 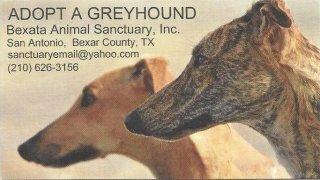 Greyhound Rescue San Antonio rescues, rehabilitates, and rehomes racing Greyhounds. Youngsters are available year round. If you’d like a home companion, jogging partner, or like lure coursing, please contact for an application after visiting our website. 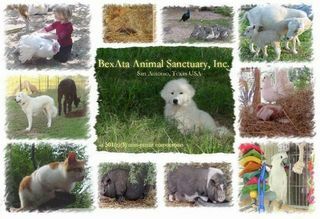 Bexata Animal Sanctuary, Inc. was established for the benefit of a variety of farm and domestic animals. We are a rescue in that we rehome some animals, but we are a sanctuary in that some will be with us for the remainder of their lives. Some animals are not adoptable, but deserve a life of love, kindness, care, comfort, and respect.